Choosing a theme is one of the more difficult tasks. To help you narrow down the options, make a list of several possible themes like the Caribbean, medieval knights of the round table, Monte Carlo, or Sci-fi. Remember to consider the season and what holidays are near your event. Holiday themed parties are always a hit among guess especially if they are around holidays like Christmas or New Years. The best themes are the ones your guests can participate in like a popular movie or TV show. You want guests to have a good time but always keep in mind the purpose of your event. If your goal is to host a fundraiser, then find a theme that encourages guests to support your cause or organization. Never forget who your audience is. If you are hosting a lot of classy people at your party, choose a more upscale theme so you meet the party goers expectations. Something like a black and white high-rollers theme is appropriate for this kind of event. If you are hosting a casual party try a barbecue, luau, or Hollywood theme. 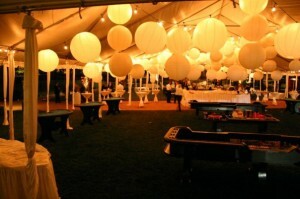 Also make sure the rental service you hire for the party can match your chosen theme. This always improves the ambiance of the event. Guests want to enjoy their experience and you want them to return next year. Accomplishing both goals means that hosts must consider every minor detail for before settling on the right theme. If you are looking for inspiration, checkout our event galley albums of past casino parties. Is the dinner upscale or casual? If it’s an upscale event, then candles can be elegant table decorations for fine casino parties. Long tapered candles create a romantic mood for guests enjoying dinner while playing blackjack, roulette, or other casino games. Dinner by candlelight is a fun experience for players at a casino party. If using long tapered candles won’t work, try tea lights. These are a good choice to maintain the casual, romantic mood at the party. They are also cheaper party supplies and a good choice for hosts who are unsure about how upscale the dinner party will really be. For more casual party themes like Si-Fi, try adding fog machines or stage lights to give the party a unique flair. Bring your theme to life and make your guests feel like they are in a disco from the 80s or a speakeasy from the roaring 20s.